I took my FujiFilm IS-Pro camera with me on a recent trip to Brecon in Wales. This included a restful trip along the Monmouthshire and Brecon canal and, at one point, the canal crosses the River Usk on an aqueduct. The view from here, back towards the town, shows a bridge carrying the B4558 road across the river, with the Usk banked by mature trees. It made for an atmospheric infrared photo. There was a conscious effort on my part to emulate a photograph that had got me enthused about infrared photography, many years before, and had stuck in my memory. It was in a scientific encyclopaedia and was part of a pair to illustrate a view in both infrared and blue/ultraviolet light, to show the difference. 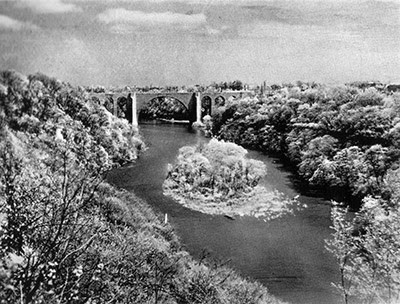 It seems that no copy of this image exists in the Kodak archives, but the bridge is sill there of course. It was completed in 1931 so was quite new when the photograph was taken. 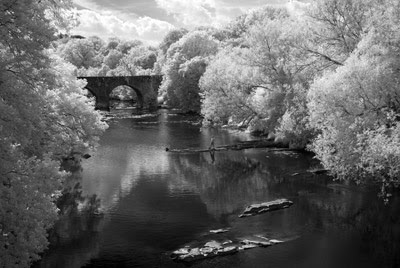 This was my introduction to infrared photography. What was yours?